Laguna del Tigre National Park in northwestern Petén is part of the Maya Biosphere Reserve. The National Park protects humid lowland broadleaf forests and extensive wetlands. 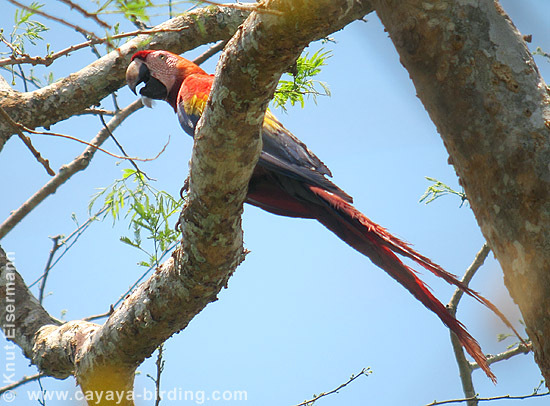 The park is the stronghold of the Guatemalan population of Scarlet Macaws, which has been extirpated at most other sites in the country, such as the Pacific slope lowlands and foothills, and the lowlands and foothills of Alta Verapaz and Izabal. 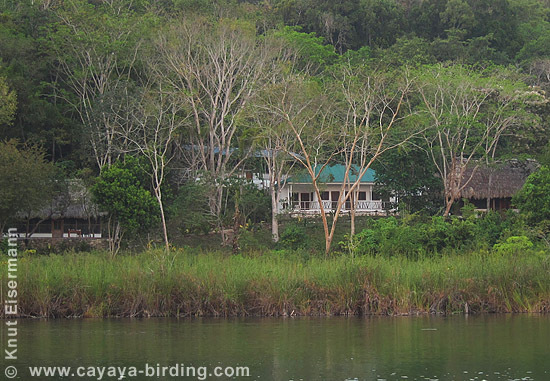 The southeastern part of the park is relatively easily accessible and the Estación Biológica Las Guacamayas at Río San Pedro provides comfortable lodging. 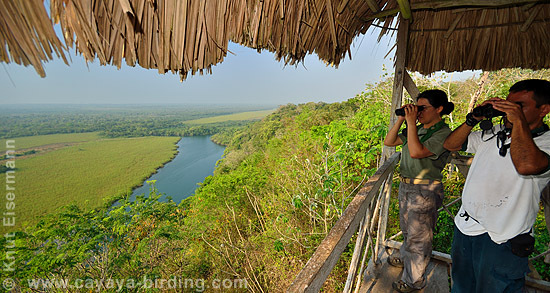 View from the observation tower at Estación Biológica Las Guacamayas. The forest north of Río San Pedro is home to more than 300 bird species of lowland rainforest. 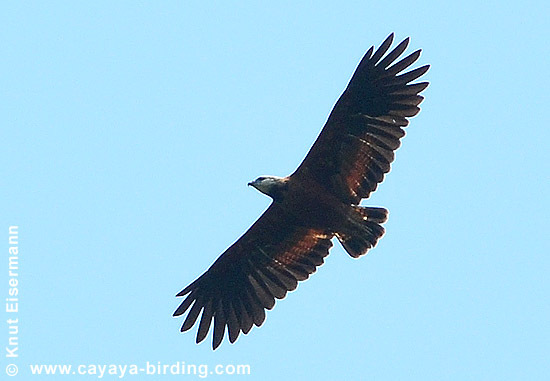 The extensive forest provides habitat to a number of forest raptors including Ornate Hawk-Eagle and Gray-headed Kite. The forest is accessible on two loop trails of 1 km and 4 km length in the surroundings of the Estación Biológica Las Guacamayas. The small loop trail has an observation tower which allows views into the surrounding forest canopy and over the plain of Río San Pedro. With some good luck Lovely Cotinga can be seen in fruiting trees. In the late morning the tower is a good spot to see forest raptors. During two mornings in March, Cayaya Birding staff recorded 4 Plumbeous Kites, 2 Swallow-tailed Kites, 1 Broad-winged Hawk, 1 Short-tailed Hawk, 1 Crane Hawk, 2 Black-collared Hawks, 1 King Vulture, 2 Bat Falons, 1 Laughing Falcon, as well as Turkey Vulture, Lesser Yellow-headed Vulture, and Black Vulture. Swallow-tailed Kite flying by at the observation tower at Estación Biológica Las Guacamayas. Most common owls around the Estación are Mottled Owl and Guatemalan Screech Owl, but also Spectacled Owl and Crested Owl have been recorded in the National Park. Along the river we recorded five species of night hawks (Pauraque, Yucatan Poorwill, Yucatan Nightjar, Lesser Nighthawk, Short-tailed Nighthawk) and Northern Potoo. The archaeoloical site El Perú is located 7 km west of Estación Biológica Las Guacamayas. El Perú is accessible from the Estación Biológica Las Guacamayas by boat along the San Pedro River with a subsequent 6 km hike through rain forest. El Perú is great for seeing Scarlet Macaws. Wildlife Conservation Society Guatemala maintains a field station in El Perú to monitor and protect the local macaw population. In scrub vegetation along the rivers and in open oak savannah some birds from the Yuctan peninsula can be observed, such as Yucatan Woodpecker, Yucatan Nightjar, Caribbean Dove, and Northern Cardinal. 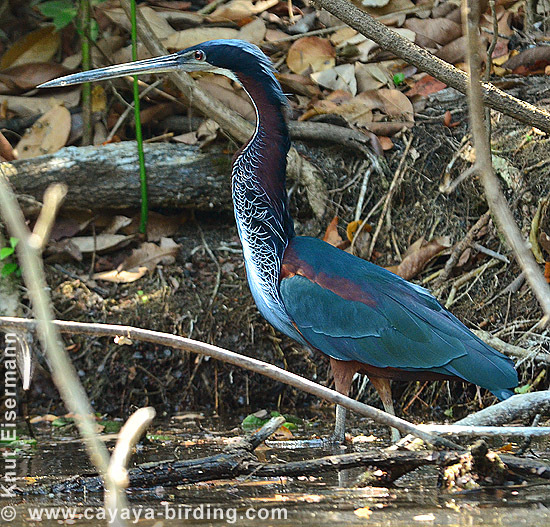 A boat tour along the San Pedro and Sacluk rivers provides opportunities to see Agami Heron. How to get there and accommodation: From the city of Flores it takes about 3 hours to get to the Estación Biológica Las Guacamayas, using a 4-WD vehicle on dirt road to the village Paso Caballo, and from there a boat on the San Pedro river. The Estación is solar energy powered and has 4 rooms with ceiling fan and private bathrooms. Also dorms with shared bathrooms are available. Meals are provided in the Estación. All visits to the Estación Biológica Las Guacamayas must be reserved. For independent travelers: We would be happy to organize your trip to Laguna del Tigre National Park. Please fill this reservation form and we will send you information on rates and space availability as soon as possible. When is the best time for a visit to Laguna del Tigre National Park? February to May may be the best time for a visit, when the dirt road to access the site is in good condition, birds are most active, forest trails are passable with hiking shoes, the water of the rivers is nice and clean, and bugs are less buggy. During the rainy season birds are still great, but road, trail, water, and bug conditions are a little rougher. Rubber boots are recommended during the rainy season. How do you support conservation and development in Laguna del Tigre National Park? Estación Biológica Las Guacamayas provides a number of jobs to the people of Paso Caballo and helps to strengthen the bond between the national park and local people. Laguna del Tigre National Park is part of the Maya-Lacandon Important Bird Area (IBA GT001). Scarlet Macaw in Laguna del Tigre National Park. Agami Heron is frequently seen along the forest rivers in Laguna del Tigre National Park. Black-collared Hawk in Laguna del Tigre National Park. Estación Biológica Las Guacamayas on the shore of San Pedro river, Laguna del Tigre National Park.